Else Marie Pade resolved that traditional music, when played on conventional instruments, could only go so far compared to the vast possibilities offered by the world of sound she could hear around her. So she decided to push the boundaries of music a little further and make something new, utilising all the media that the technology of the 1950s had to offer. Her avant-garde journeys into sound were first heard on the collection ‘Konkret Musik’ (concrete music) in 1952, but it was in 1955 that Denmark’s first ever piece of electronic music was created. Pade called it ‘En dag på Dyrehavsbakken’ (a day at Dyrehavsbakken), and though it may not have caused much of a stir back then, Pade, who passed away earlier this year aged 91, has been rediscovered and revamped by today’s own sound artists. Pade was practically ignored in her own country. Instead, she had to go to conventions in Brussels, Cologne and Paris to meet her mentors, Pierre Schaeffer and Karlheinz Stockhausen, who were working as experimentally as she was. It took half a century of change for Pade to receive recognition for her pioneering compositions. She was awarded the Steppulv Prize, a national award given annually by Danish music critics for the year’s best idea, in 2001. Four years later, her music was reissued, remixed and an autobiography published. Music was not the only thing in Pade’s eventful life. During the occupation of Denmark by Germany during the Second World War, she was active in the resistance movement, earning her a stay in the Frøslev internment camp in southern Jutland in 1944. Pade was one of 12,000 political prisoners to be interned there during the nine months of its existence. It was probably ‘concentration camp syndrome’ that caused Pade to have black-outs every time she tried to perform on the piano – an instrument she had played since childhood. The black-outs, which luckily ceased to occur over time, forced her to give up the idea of ever becoming a professional piano player and to focus instead on composing. ‘Concrete music’ was a term that first came into use in the late 1940s. It was coined by the pioneering French composer Pierre Schaeffer (1910-1995) to describe music based on natural sounds that have been recorded and played back in a musical context. The first public performance of ‘La musique concrete’ was in 1950 in Paris, where Schaeffer utilised a PA system, several turntables and mixers for the very first time. His 1952 book ‘The Search for a Concrete Music’ attempted to define sound using the most exact descriptions possible, and it was a book that Else Marie Pade devoured earnestly. She was to become the Danish ambassador for concrete music. For ‘En dag på Dyrehavsbakken’, she persuaded eight technicians from the public broadcaster DR to follow her around the entertainment park of Dyrehavsbakken for almost every day of its 1954 season, recording sounds that were then manipulated under her direction for a production commissioned by DR for the brand new wonder that was television. 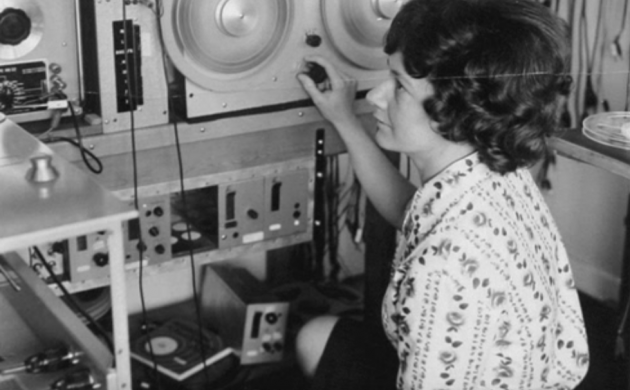 In 1955, Pade was hired by DR, which started to sporadically broadcast her sound experiments. Then, in 1958, she was hired as the secretary of radio producer Karl Bjarnhof – a job she kept until 1964, when she quit, giving herself time to make her own music while working as a freelance producer. In 1958, she helped to create Aspekt, a union for experimental artists of the time, along with writer Jørgen Nash and painter Martin Jepsen. Whilst working on an opera for children, ‘Father, Mother, and Children’, she had the idea of developing concrete sound as stimulation for physically-handicapped children, a program developed in collaboration with the Copenhagen Royal Hospital that yielded positive results, but was cancelled for economic reasons.